1. 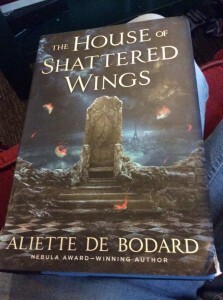 The House of Shattered Wings, by Aliette de Bodard. Rich, immersive, gorgeous dark fantasy with fallen angels and Vietnamese Immortals, set in a magically post-apocalyptic version of twentieth-century Paris. I read the whole thing on my overnight plane ride back from America to the UK this summer and was so absorbed, I didn't even mind the lost sleep! You can read my full Goodreads review here. 2. Magic Breaks, by Ilona Andrews. This feels like a cheat, in a way, because I'm recommending a book that really wouldn't work on its own at all - it's Book 7 in a (so far) 8-book series, and it's the climax of a massive seven-book storyline - but oh WOW did it deliver on that storyline! I bounced off the first book in this series when I tried it a few years ago, but smart friends recommended that I try again by starting, this time, with Book 3, Magic Strikes, and I've been a huge fan of the series ever since. They're all fun and romantic urban fantasy adventures, but Magic Breaks was my very favorite so far. 3. 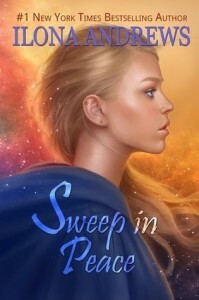 Sweep in Peace, also by Ilona Andrews. This is Book 2 in a series set in a magical inn in Texas that mixes urban fantasy with space opera, and while I did enjoy Book 1, the mix of genres didn't entirely work for me in that one. Book 2, though, was just AWESOME from start to finish! This may well be the most purely fun book I've read this year, and I loved it. (It would also stand alone just fine for anyone who hadn't read Book 1.) You can read my Goodreads review here. 4. Wylding Hall, by Elizabeth Hand. Creepy fairy magic mixes with British acid-folk music in an incredibly compelling and beautifully-written novel in the form of a series of interviews with the surviving band members. It's probably my favorite Elizabeth Hand novel so far, which is saying a lot. I loved it. 5. Uprooted, by Naomi Novik. This book! It has such a warm, insta-classic feel, and it grabbed me as an adult in just the same way that Robin McKinley's Beauty and Meredith Pierce's Darkangel grabbed me as a teen. Wonderful and wonderfully fun romantic fantasy for adults! You can read my full Goodreads review here. Signal to Noise, by Silvia Moreno-García (a really unique and original urban fantasy set in Mexico City, which I reviewed for Urban Fantasy Magazine here) and V.E. Schwab's witty, world-leaping fantasy novel A Darker Shade of Magic. (See my Urban Fantasy Magazine review here). 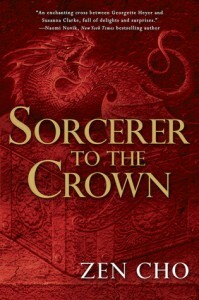 Zen Cho's Sorcerer to the Crown looks AMAZING, and I was so looking forward to reading it...only to run into an unexpected stumbling block when I started reading and suddenly realized that we had a slight conceptual overlap (with one of my not-yet-finished projects). Urk. I had to stop reading because I was afraid of letting myself get influenced by the way she'd handled it in her story before I wrote my own book. But the tiny bit I read was FANTASTIC - think Georgette Heyer-style Regency romance with fabulously imaginative magic! So I'm really looking forward to reading the rest as soon as I finish my own project. I have already started Kate Elliott's Black Wolves and am loving it so much, so far, that I wanted to mention it here - but I'm still only 200 pages into the book and would feel silly trying to talk about it as a whole at this point. Still, if you like smart, absorbing epic fantasy with lots of wonderful female characters, you should check that one out, too! What about you guys? Which fantasy novels for adults did you love this year? My other favorite reads from this year are Heather Rose Jones's two Alpennia books, Daughter of Mystery and The Mystic Marriage. Strong smart women! Alchemy! Scholars and duelists! All of this set in a Ruritanian country called Alpennia, not long after the Napoleonic wars.